The half and half gives it a light creamy taste, while still letting the sausage shine though. The red pepper gives it a nice bite, and the kale gives it a light touch of brightness and bitterness to balance the sausage and dairy. 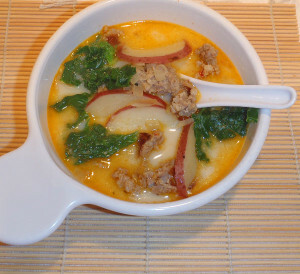 Although from the ingredients list it looks like a rich soup, it’s actually quite light, since there are 10 cups of stock & water, and only one cup of half and half, and nearly all the grease is drained from the sausage after cooking. 2 Pounds Low-starch potatoes, washed, eyes removed and sliced into 1/4 inch disks. Peeling is optional. Baking Potatoes, Russet, White & General Purpose are all high starch and great for baking, mashing and frying. But not for this soup. They’ll make it feel “grainy” when reheated. “All Purpose” potatoes are somewhere in the middle and like “One Size Fits All” clothing, aren’t really the best choice for any purpose. Boiling Potatoes, Round White or Red Potatoes are low starch and will cook beautifully in soup. They’ll keep their shape and texture, even when reheated and not turn the soup into a grainy mess. Note: I’m always disappointed when a pot of soup runs out the interesting stuff before the broth is gone, so this recipe includes quite a bit of sausage and potato and kale as well as additional spice and seasoning to handle the extra ingredients. If made as shown above, you’ll get a pot full of soup with “good stuff” all the way from the top to the bottom. If you’re looking for something lighter, feel free to reduce the potato, sausage, garlic, salt and ground red pepper by one-half, which will give you something closer to the proportions that OG uses. Kale tends to have dirt, sand, etc. stuck in it, so it needs a good washing. It also will leak “green” into your soup making it look nasty. A quick blanch in boiling water will both clean the kale and prevent it from turning your soup green. The recipe below includes this step. Fill a large pot with water, bring it to a rolling boil and add some salt – about the same amount of salt as if you were making pasta. Fill a large bowl with cold water and some ice. Put a large colander in the sink. Cut the base off the head of kale and roughly tear the leaves into 2″ pieces, discarding the hard portion of the rib, and place in the colander for later. Olive Garden leaves the rib in, but I think it’s too big and hard to put on a soup spoon. Place the garlic in a mortar and pestle with a heavy pinch of kosher salt and mash until liquid, or finely mince, then grind with the back edge of a knife. You need at least two heaping Tablespoons of mashed garlic when you’re done. Cut the raw sausage into 1/2 inch chunks with shears or a knife. Add a little oil to the bottom of a large pot. Add the sausage. Sauté on medium until fully cooked and you have developed a good deal of fond (brown stuff) on the bottom of the pot. Pour off grease as necessary and build as much fond as possible without burning or drying out the sausage. Remove the sausage and save. Pour off the excess fat, leaving just enough to coat the bottom of the pot. Drop all the kale into the boiling salted water. Wait a few seconds until the kale turns bright green, then immediately dump the boiling water and kale into the colander in the sink. Then dump the hot, drained kale into the bowl of ice water and swish it around. Dump the chilled kale into the colander to drain. Add the finely diced onions and sauté on medium until soft, nicely browned, and more fond develops. Add the garlic and continue stirring until just fragrant and soft (probably about a minute). Be careful to not to burn or brown the garlic. Add the ground red pepper and mix. Add a small amount of water and deglaze the bottom of the pot (scrape up all the yummy brown bits). Add the rest of the water, the chicken stock, the potatoes and sausage. Bring to a slow simmer and continue simmering until the potatoes are soft. Add the kale then turn off the heat. Immediately before serving, add the half and half, and serve with some nice home-baked Ciabatta bread.